‘Kate, Michael, and Emma have been in one orphanage after another for the last ten years, passed along like lost baggage. Before long, Kate, Michael, and Emma are on a journey to dangerous and secret corners of the world…a journey of allies and enemies, of magic and mayhem. And—if an ancient prophesy is correct—what they do can change history, and it is up to them to set things right. I really didn’t enjoy this book. For me, the idea was unoriginal and stale – orphans destined for a ancient prophesy. It’s being done, and done well. This premise seemed very similar to Harry Potter except there wasn’t anything special, the prose seemed stiff and formalic and there was no humour.The three orphans have being living in care since their parents disappeared years ago. Suddenly they are whisked away to Cambridge Falls ,a mysterious and magical place with an unexplained past . I felt no connection to the characters – Emma was a tomboy, Michael a brainiac and Emma who spent all her time worrying about her siblings. None of them had personailities or quirks that any normal person would have.They weren’t very likable and the dialouge between them felt very stilted and unnatural. It didn’t feel, whilst reading the book, that the author had any passion for writing, instead I felt like I was reading a mashed up version of Harry Potter/The Chronicles of Narnia, with no rememberable characters or distiunguishing plot features. 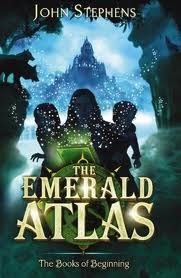 I hate giving negative reviews, and I wish that I could have enjoyed The Emerald Atlas better. Maybe it’s because I am older then the target audience but I won’t be picking up the remaining two books in the trilogy. My absolute favourite genre is middle grade fantasy, but unfortunately for me, this was a let down.